The Success Ratio pie chart display an overall graphical representation of the success ratio of the project for a particular time period. 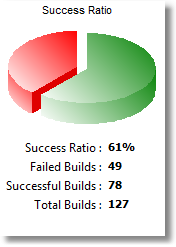 Underneath the success ratio graph is a total of the failed builds, successful builds, overall total, and the success ratio as a percentage. The success ratio chart cannot be exported or printed.